My sister has been suffering from rhinitis for a long time. Initially, we just considered it a minor illness and did not pay any attention to it. We don’t think that it will unfortunately develop into laryngeal cancer one day, either. But in January 2005, my sister found bloodshot in her sputum when she is brushing and coughing. To be prudent, she did a laryngoscopy in a local hospital of Vietnam. 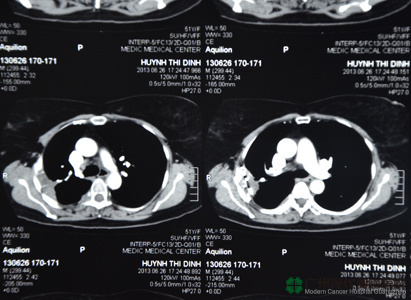 The result showed out of her expectation that she was suffered from laryngeal cancer. And from then on, she began a long journey struggling with throat cancer. How to deal with recurrent laryngeal cancer? Although the test results made her so sad and shocked, she is still perked up fast and taken treatments aggressively. After suffering from 35 times of radiation and enduring over the pain caused by the side effects, her disease was brought under control and finally discharged in March 2006. We all thought that she had got rid of the entanglement of laryngeal cancer, but it came back again. In May 2009, she felt intense pain in her shoulder which seriously affected her normal life. After checking up in the hospital, we were told that her laryngeal cancer was recurrent and metastasized to the lungs which led to compression of the nerve and shoulder pain. The recurrence of cancer made her very depressed. In addition to loss of appetite and poor sleeping quality, her body becomes increasingly frail. All our family members are so anxious and did our best to find better treatments for her. From the newspaper, we know about Modern Cancer Hospital Guangzhou. When visiting the Hanoi Office of Modern Cancer Hospital Guangzhou, we met patients who have been treated in the hospital fortunately. 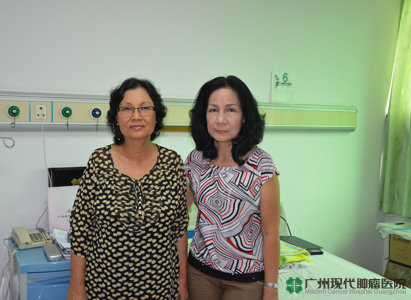 They shared their cancer treatment experience with us, appeased us not to worry, told us the advanced technology & quality services in Modern Cancer Hospital Guangzhou, and encouraged my sister maintain an optimistic attitude to fight against cancer. Although we were still not very clear about Modern Cancer Hospital Guangzhou, we were still holding the opinion to try for a better treatment and flied for Guangzhou, China. But when we arrived in Guangzhou, my sister's condition was getting worse and even breathing in difficulty. Doctors in the hospital immediately arranged systematic checks for my sister and convened an expert group for consultation in order to make out a treatment plan to alleviate the pain of my sister as soon as possible. After putting anti-cancer drugs directly into the lung tumor by interventional manners, my sister’s symptom of difficulty breathing is alleviated. 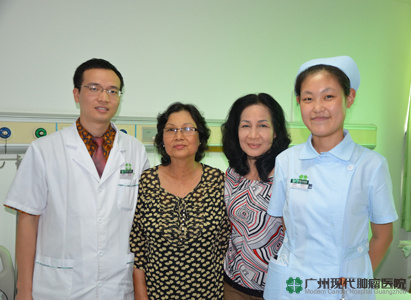 Based on the changes of her condition, doctors in Modern Cancer Hospital Guangzhou then combined interventional therapy, seed implantation, cryotherapy and biological immune therapy together to comprehensively treat her. 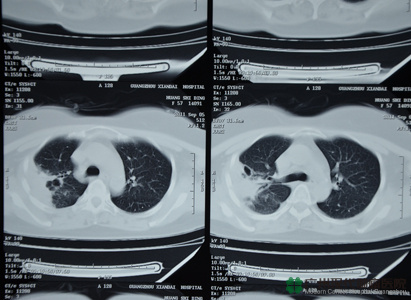 Implanted small particles in the tumors of the lungs and kill them by way of internal radiation. Then cryotherapy which is a treatment freezing the cancer cells to death. These treatments are all minimally invasive manners that will not bring huge side effects to the patient’s body. And in order to fight cancer better, doctors use immune therapy to effectively improve the immunity of her body. Now, her quality of life was improved obviously. In this regard, we are very pleased and grateful. After suffering from laryngeal cancer, my sister often feel helpless and sad. But the improvement of her condition increases her confidence, the support and encouragement from her kids and doctors are also her strong backing. Sister often participated in activities organized by the hospital. She shared her cancer fighting experience with other patients, encouraged them to insist since anticancer things cannot be done in one or two days. They also need to keep a positive attitude and believe in the doctors, believe in themselves! In her cancer fighting journey, we accompanied my sister all the way and helped her on living and eating things. We eliminated her negative psychological attitude, supported and encouraged her to take overseas treatment action. After each treatment, we help her making diets with balanced nutrition to make her body absorb enough nutrients and store enough energy in order to fight against cancer better! Cancer fighting journey is still long, but I will always support on her.